[Trinity] Hereos WoW 3.3.5 +8 Custom Races Fun Private Server!! 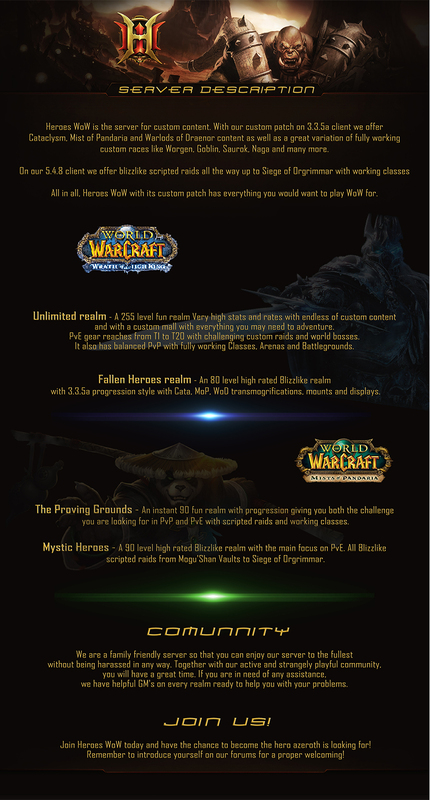 Thread: Hereos WoW 3.3.5 +8 Custom Races Fun Private Server!! Hereos WoW 3.3.5 +8 Custom Races Fun Private Server!! 4/10. Great content, horrible community. I was banned on the spot for telling a GM he was being rude. The staffs ego is very high, the development is amazing. ALSO, HeroesWoW is LUA based, therefore it is not Trinity. HeroesWoW is LUA based, therefore it is not Trinity. I can confirm it is using a TrinityCore based emulator. New patch will be available(soon) in Unlimited and Heroes WoW Realms. People without patch won't get error anymore So we won't force you to install it. Some pictures from new patch. Last edited by Chrispee; 10-25-2012 at 01:18 AM. I assure you, what happened is: HE said "Don't talk to me, i'm in a bad mood and it will result negatively for you" so I said he was acting rude and BAM permaban. Looks good Chrispee, was wondering what you've been up to lately. New Core and new db all Updated , and much more come and check them up !! !